In last week’s post I showed some terrific human faced masks by Manuel Centella Escalante. This week I will round out your exposure with a few more remarkable examples, along with others that may seem less impressive, but they extend our awareness of Centella’s range of features. The four masks that lead off in today’s post were photographed from the collection of David West, the owner of the Gallery West in Tucson, Arizona; I thank him for his helpful support. The first of these is a particularly elegant example. It was purchased in Sonora by a tourist, who later sold it in 1960 to Tom Bahti, a Tucson Indian arts dealer. Given the impressive wear on the back, this mask could easily date to 1950 or earlier. Painted decoration such as the white triangles under the eyes and parts of the rim design were not outlined with inscribed lines, but instead with pricked or “pecked” lines. I have seen this on no other Centella mask. The mouth, with lips like those of some female movie star, is also unusual. The rim design is also elegant; I call it Centella’s “drapery” rim design, because it reminds me of the swags interior designers place around windows. In this side view the pricked design around the triangles under the eyes is particularly easy to see. In 1990 I purchased a wonderful Yaqui Pascola mask with the face of a Chango (an ape or monkey) from Robin and Barbara Cleaver. As was frequently the case, this mask came up from Mexico at that time with little history. 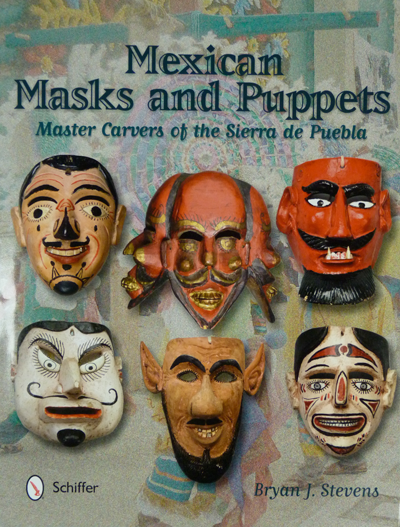 There was a similar mask in the collection of James Griffith, and he had included it in the book that he wrote with Felipe Molina—Old Men of the Fiesta: An Introduction to the Pascola Arts (1980, page 23, fig. 10 right). That mask too lacked an identified carver, but Griffith did state that it dated to the early 1970’s. I didn’t meet Tom Kolaz until about one year later; he told me that both masks were the work of Manuel Centella Escalante. I later realized that a handsome Goat pascola mask from about 1960, which was in the same photo as Griffith’s Chango mask, had also been carved by Manuel Centella. Two things became apparent in the years that followed—that there were many more unidentified Manuel Centella masks in private and museum collections, and that this relatively unknown carver was one of the most brilliant Yaqui artists of the mid-20th century. In this post and several more to follow I will celebrate his work. Today I will show a series of Chango masks by Manuel. 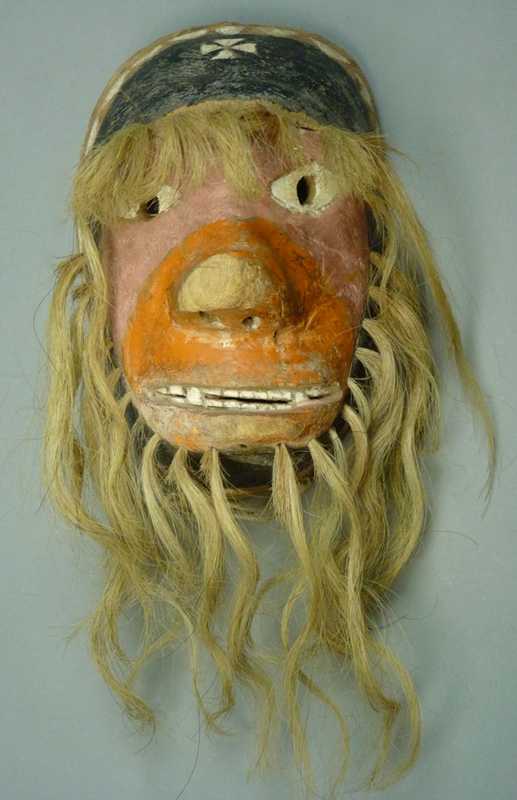 I share the impression of James Griffith that this carver may well have been the inventor of these Chango masks. He was certainly the one who created a number of them during a period when they were popular, sometime in the 1960s or 70s. They had their moment, but since then human faced masks and canine masks have been most commonly chosen by dancers. One of the more reliable distinguishing factors for this carver is this forehead cross, which consists of four triangles with their points together. Often there is a chin cross of the same design, but we shall not see this on the majority of the Chango masks. In June, 1988 I bought my first Yaqui Pascola masks from Robin and Barbara Cleaver. So far you have seen two of those masks—a human faced Pascola by Román Borbón and a goat by Alejandro Reyes Alegria. I bought today’s Yaqui Pascola mask from the Cleavers in 1990. 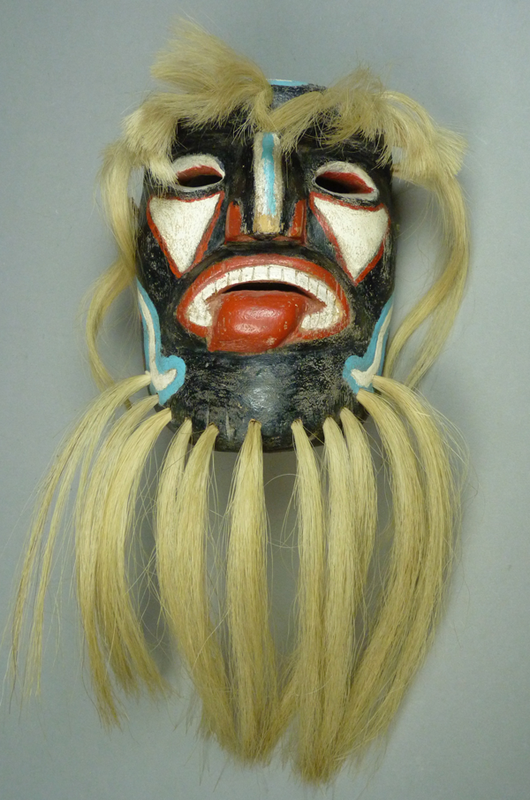 All three were initially anonymous, and as with the other two, I became curious to learn the name of the carver of this mask. I confess that I pestered my friend Tom Kolaz for years with erroneous ideas that he rejected, and eventually I accepted the likelihood that this was one mask that would probably remain anonymous. Here is that mask, which probably dates to the 1960s or 70s. Because of the lolling tongue and the informal paint I thought of Antonio Bacasewa and Inez “Cheto” Álvarez as the possible carvers; I will introduce Cheto’s masks in a later post.